On Friday the National Park Service published their GGNRA Draft Dog Management Plan which is now open for public comment until April 14, 2011. The Golden Gate National Recreation Area encompasses over eighty thousand acres of Marin, San Francisco and San Mateo counties. 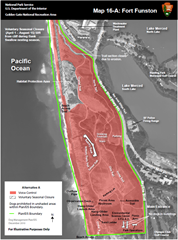 In San Francisco GGNRA managed lands include Baker Beach, Crissy Field, Fort Funston and Ocean Beach. 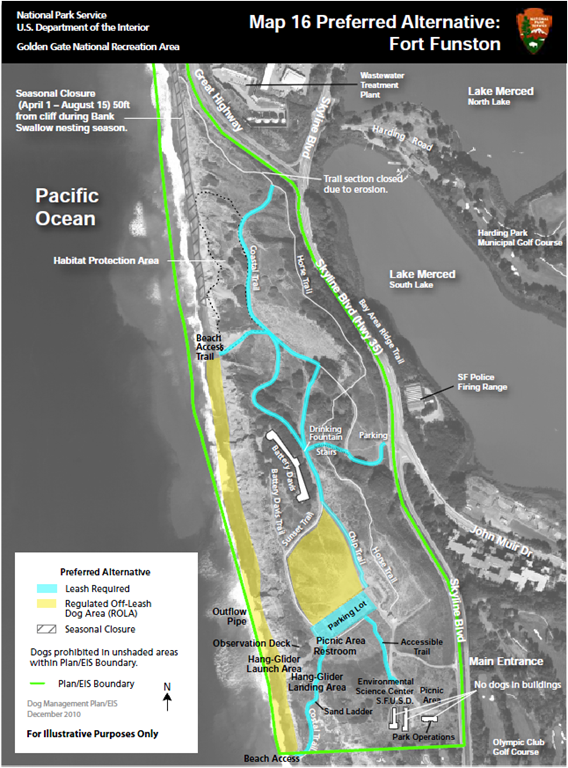 If you care one way or the other about dog access to the GGNRA please take the time to review the plan and send in your feedback. I’ve reproduced my comments in full below. In other words, despite the two thousand plus page dog management plan we’re being asked to accept that the NPS can revoke access in the future without further consultation. The ‘adaptive management’ described in the plan would use NPS maintained statistics to downgrade off-leash to on-leash to no dogs at all and explicitly rules out ever moving any area in the opposite direction. My family owns a dog and lives in San Francisco. We visit the GGNRA at least once a week. The Draft Dog Management Plan would reduce our enjoyment and use of the park considerably. In the plan the enabling legislation for the GGNRA is quoted: “In order to preserve for public use and enjoyment certain areas of Marin and San Francisco counties, California, possessing outstanding natural, historic, scenic and recreational values and in order to provide for the maintenance of needed recreational open space necessary to urban environment and planning, the Golden Gate National Recreation Area is hereby established”. The plan also discusses the long history of off-leash dog access before and after the creation of the park. Because open space is so limited in San Francisco, and because the GGNRA controls the entire coastline I strongly support continued access to provide reasonable exercise and recreation for dogs and their owners. I’m very concerned about the tone of the plan and some of the specific provisions. The objectives listed in the executive summary all relate to controlling, reducing and restricting dog access. Given the park’s charter to provide ‘public use and enjoyment’ and ‘needed recreation open space’ an important objective should be to preserve sufficient space for off-leash dog access. The plan exhaustively lists real and theoretical issues related to dog access however there is no comparable section discussing issues with prohibiting or restricting dog access. These include wasting limited park resources on restricting responsible dog owners rather than cautioning the irresponsible, forcing dog owners to travel further to take their dogs for a reasonable walk and increasing the likelihood of aggression by concentrating dogs in increasingly small designated areas. The plan also continually discusses dog access in the context of park-wide regulations preventing any off-leash dog walking. San Francisco donated properties to the GGNRA on the proviso that traditional recreation would be maintained. The tone suggests that leash-free access was a mistake, and that the park service is begrudgingly fulfilling the park’s mission only when forced to do so. I’d have much more confidence in the process if the plan started from the position of accepting a variety of recreational activities, including off-leash dog walking, and then attempted to balance the varied needs of visitors, culture and wildlife from there. Given this I find the adaptive management provision of the regulated off-leash areas (ROLAs) to be unacceptable. This provides the NPS with a mechanism to further erode dog access to on-leash only and even to prohibit dogs entirely without further consultation. The plan further states that under no circumstances will the reverse be true – once dogs are banned the park will never consider opening up access again. This is a far greater threat to preserving the park for future generations than any amount of dog access. Rather than penalizing the vast majority of responsible dog owners the Dog Management Plan should focus on enforcing existing rules and regulations. The preferred alternative is far too restrictive. When the closed section of trail to the north of Fort Funston is open again there should be off-leash access for the full length of the beach and alongside trails so that a loop can be made down the sand ladder and then returning via the central or northern access trails. Of all the GGNRA sites Funston would seem to be the best candidate for Alternative A – maintaining current access – especially if the preferred alternative is selected for restricting most of Ocean Beach. We visit Fort Funston weekly, rain or shine, and given how heavily the area is used I’m surprised at how rare it is to encounter any problems. The preferred alternative is a good balance. When the east beach is busy there can be far too many dogs and people competing for space. For this reason we usually visit Crissy field when the weather is too severe to walk on an ocean facing beach and so it tends to be just dog walkers anyway. The preferred alternative is reasonable, provided that Fort Funston is not overly restricted (see above). The preferred alternative massively reduces the trail available for hikers with a dog. We often complete the loop up the coastal trail to Hill 88 and then down Wolf Ridge / Miwok to return to Rodeo Beach. The trails are rarely crowded and a well behaved dog has no more impact than a person. The Hill 88 loop should be kept open to off-leash dogs. The preferred alternative for Rodeo Beach is acceptable. Update January 17, 2011: KQED has a Forum segment on the dog management plan at 9am PST today. Join the discussion or access the audio archive here. Update February 2, 2011: Sign up for this Facebook page: Save Off-Leash Dog Walking Areas in the SF Bay Area.